John was born in Dordrecht, The Netherlands to biology teacher Willemien and bookbinder Willem (specialized in ancient books and bibles). He has a brother, engineer Ton, and, since 2009, has been married to UN war crimes investigator and human rights specialist Lina. He studied law at Erasmus University Rotterdam, European Union law at the Bruges College of Europe and human rights at the European Master’s Programme in Human Rights and Democratization in Venice. He holds a PhD in international law from the European University Institute in Florence. Since finishing the PhD in 2009 John has combined a part-time appointment as a university lecturer in European human rights law at the University of Groningen with different positions in Dutch civil service. He worked as a senior EU affairs adviser and senior human rights law at the Ministries of Justice and the Interior, working mainly on EU human rights and rule of law-, and privacy issues. More recently he served as the head of unit of the Interior Ministry at the Dutch Permanent Representation to the EU, including during the Netherlands EU presidency in 2016. His interests range from general international law to international and European human rights law to EU law, and more recently, populism. 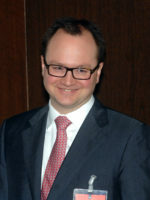 John’s publications and book reviews have appeared, amongst others, in Common Market Law Review, European Law Journal, International and Comparative Law Quarterly and Netherlands International Law Review and in edited books published by, for example, Oxford University Press, Cambridge University Press and Hart Publishing. It's not them, it's me (and I don't like what I see) - Challenging the European populist challenge: from introspection to action. This project addresses the European populist challenge to liberal democracy with a view to developing policy-informed, evidence-based, actionable and (more) effective responses to it. It seeks first to characterize current national and EU-level policy, institutional, legislative, political and judicial reactions to the populist challenge. It will then contrast these legal and policy reactions with populism’s quite diverse appearances in an effort to highlight that there is no one-size-fits-all answer to populist agendas focused on substantively different issues. Breaking with the tendency of single-discipline approaches, the project will draw from law, political science, sociology, and insights from the education and communication fields (as well as 10 years of experience as a senior civil servant) and make recommendations on areas of focus for a comprehensive agenda and strategy to counteract populism. The project will distinguish areas where better tailored explanations or audience specific defenses of liberal democracy’s foundations would suffice, and areas that would need legislative, institutional or other adaptation or reinforcement. The overall purpose is to demonstrate that populism requires introspection and actions of different sorts. While there are many areas where immediate reaction to populists’ damaging actions are both possible and necessary, there are also issues requiring a remedy which their voters often quite rightfully identify as problematic while those they vote for offer only “solutions” inconsistent with liberal democracy. If widespread European populism is in this way an invitation to critical self-reflection on the functioning of liberal democracy today, this project accepts it.